Hubby has been off for a week of much-needed time away. That last Sunday before going back on Monday is always dreaded. Kind of like an all day reminder that “the party’s over”. Note to self, don’t forget to buy the lotto tickets this week! As I mentioned in my Happy Anniversary post, our younger set of kids have been in Ireland for the past couple of weeks. We didn’t hear from them the first few days and yes, it was concerning to this mother’s heart. I just needed to know their flight landed safely AND hear it/read it from them. The assuming thing has never worked well for me. Nor has the no news is good news. Give me concrete. No matter how hard I try to be a normal adult friend to my kids, the “mom” just comes out. I can’t help it. I found myself asking about their car, the roads, the traffic. Did they see sunshine? How was the food, were they taking their probiotics? Were the people kind? Did they feel safe in their bed and breakfasts? And then after twenty questions, they broke their silence on a secret. The ultimate “don’t” they “did”. Worse than running with scissors. They picked up a stranger, at a bank no less, when exchanging for euros. They crammed her into the back of their tiny rented car with their mega luggage. They drove her to the Cliffs of Moher, as they were going there anyways. She was a graduate student from the states, backpacking alone through much of Europe. She would eventually return home to teach. She wanted to know more of the tornadoes of Oklahoma and Missouri. They spent much of that day with her. She could have been an axe murderer. But I talked to them after the fact, so if she was, she spared them. Thank. Goodness. I still struggle some days, wrapping my head around “social media”. 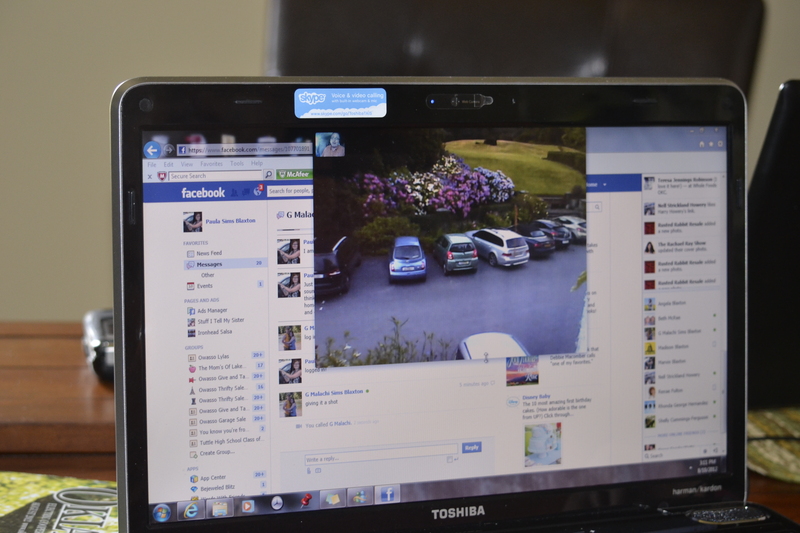 It is because of Skype minutes and Facebook that we were able to stay in communication with our traveling children. And because of Facebook, twitter and WordPress, that I have met each of you or reconnected with you! Scaling the path of resistance can lead to broader horizons. I have never been to Ireland. 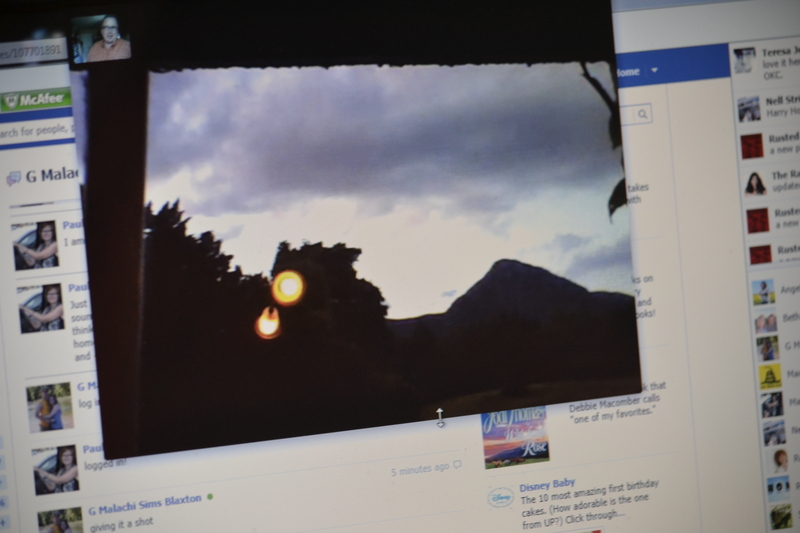 But I have now seen a view of it through a castle window via Facebook video. I have not picked up a hitch hiker in many moons. But I have found you through my daily travels. And hopefully none of you are axe murderers, either. I miss you when I am gone. This entry was posted in Uncategorized and tagged a mother's heart, axe murderer, Castle, Cliffs of Moher, Europe, facebook, Facebook Video, hitch hikers, Ireland, Okie from Muskogee, skype, twitter, View through a Castle Window, WordPress. Bookmark the permalink. Glad you enjoyed your time off AND that your kids are truly blessed! I know our daughter gets really tired of the “call me when you get there” routine, but as long as I am alive and she is not sitting beside me, I NEED that phone call! Now, have fun getting caught up! Well Paula, if this makes you feel any better….our oldest daughter just turned 59 and I still insist on a phone call when she and her husband are traveling. It never ends…Mom’s have to know their kids are safe. I have no memory of this…… so provide ME with more details! Awww Paula, you are SUCH a MOM! Sounds like the kids are doing great over there. Axe Murderer…lol. I know, we ALL go there. And as for the song? Who doesn’t like a bit of Merle now and again. Rest well Mother…the kids are blooming fine! 🙂 They really are….I am so proud of them. You should be…Maybe somewhere down the line, you and hubs will be the ones skyping from there yeah? Ohhh to dream. GET THE PILLS…do NOT let it stop you Paula. CARPE VOLANS (flying). I do still fly….but nobody wants to set next to me or claim they know me!!!! hehe…that’s ok. who cares a hoot for that. sit next to a stranger and charm him to tears (or laughter) or just let your head lull on their shoulder. DO IT! I am sure that because it was YOU dear lady that raised the kids that they have a very good sense of who is an axe murderer and who isn’t. 🙂 And if they mis-judge then they probably have the people/speaking skills to talk the axe murderer out of their intended plan. And not only that, but if they are anything like yourself they would be talking the murderer into joining a monastery/convent and turning their life around. LOL. 🙂 They are both easy to know…and love meeting new people. It sounds like this young lady was very sweet…..glad I didn’t know til after though! You have taught them well, job well done!! I am the same way with my sister and friends, it’s been drilled into me and I love it! I found myself watching the olympics and thinking that I couldn’t imagine anyone there being dangerous and I suspect I’d feel the same in Ireland. It’s silly I know and I wouldn’t be pleased either if my child picked up a stranger. Thanks for adding me..I totally agree..being kind to people is important..you never know when they or you might need a lending hand! I am just not cool enough for my “mom” not to come out with my kids — loved this post–glad you visited my blog so I could find yours! I like you already. You AND your kids are very blessed. 🙂 I’m glad you picked up the phone when your kids called. I may not have answered it if I saw an unavailable number show up in my caller ID.